• Family Food Fight ends on 594,000 – enough to recommission? 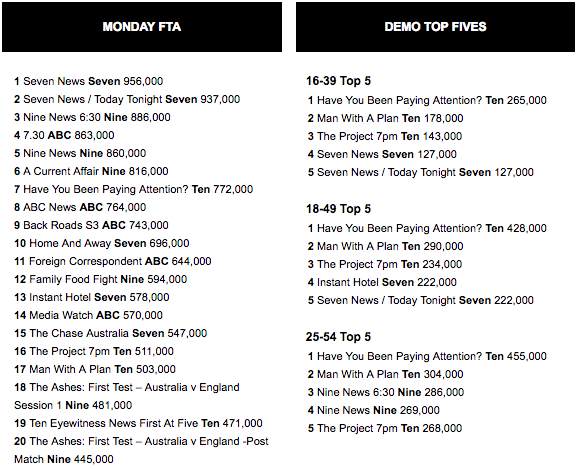 The last week of survey for Home and Away started with 696,000 after a week 47 average of 665,000. On Instant Hotel episode 10 guests travelled to Mikey and Shay‘s suburban mansion in West Pennant Hills, which is the final Instant Hotel of the series. The episode did 578,000 after 587,000 last week. The first final screens tonight. Criminal Minds got an early Monday slot with two episodes after 8.40pm on 407,000 and then 327,000. The 2017 Miss Universe event followed at close to 11pm with 69,000 watching and a finish well into the morning. The competition also got a daytime screening on the network yesterday after 11am with 103,000 watching. There was plenty on offer about Don Burke with news bulletins across the day carrying reports on the allegations made earlier in the day in Fairfax newspapers with TV showing clips from ABC interviews with his accusers. Tracy Grimshaw conducted what she said was Burke’s only TV interview with the one-on-one taking over the complete Monday episode of A Current Affair. (See our roundup for highlights from the interview.) The episode did 816,000 after a week 47 average of 688,000. The season final of Family Food Fight saw the Shahrouks up against the Butlers. The Shahrouks (sisters Halla, Houda, Rouba and Leeann) triumphed after a hard-fought battle against the talented Butler family (EJ, Aleks, Kate and John), taking home the title and the $100,000 prize money. The series has never really performed close to what Nine would have wanted and the final did 594,000. Given the way consumers digest the content these days it is hard to judge success or otherwise. Many people claimed Yummy Mummies the flop of the year (see TEN summary below), but Seven has recommissioned it. Keeping the food theme alive was the Nine Monday movie Burnt, starring Bradley Cooper as a top chef, which did 219,000. 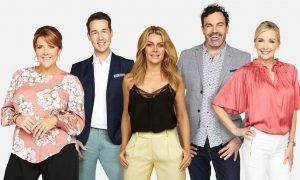 It was Kyle and Jackie O night on the channel with the top-rating Sydney FM hosts guests on The Project to promote an appearance on All Star Family Feud. Before the radio hosts appeared, The Project reported on the Don Burke allegations with commentary from Fairfax’s Kate McClymont. The Monday episode did 511,000 at 7pm after a week 37 average of 433,000. All Star Family Feud then pitted Team Jackie against Team Kyle. Team Jackie was made up of her dad Tony, sister-in-law Kelly and a KIIS listener Martin. The Sandilands team consisted of Kyle’s partner Imogen, their houseboy Nima and Kyle and Jackie O listener Tanya. The winner – team Kyle with a total of $30,000 going to the charities nominated. The program did 453,000, which was up about 100,000 on last week’s episode. The final episode of Have You Been Paying Attention? was a special year in review. 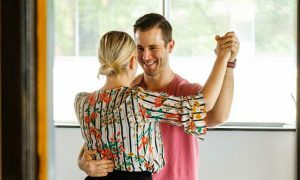 The highs and the lows of the year included Seven’s Yummy Mummies – it is fair to say TEN and Seven have different takes on how successful that series was. 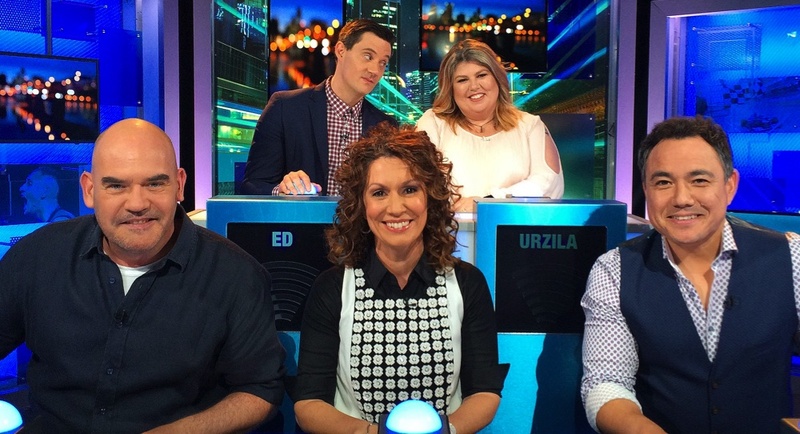 Guests included Urzila Carlson, Kitty Flanagan and Marty Sheargold, who joined regulars Ed and Sam. Carlson was the big winner of the final ep of 2017 on 200 points. The final episode did 778,000, which should again make it the channel’s #1 show of the week. The show has been doing the heavy lifting for the network on Mondays across 30 episodes that started way back in May. Two episodes of Man With A Plan followed on 321,000 before the audience settled on 155,000 for the second. Don Burke was the key feature on 7.30 with a number of interviews with former employees making accusations about Don Burke. Two of the interviews were conducted in America, one in the US and another in Mexico. Later in the show Leigh Sales spoke with a former CEO of Don and Marea Burke‘s CTC Productions, Michael Freedman. The rest of 7.30 was taken up with highlights from the Tracy Grimshaw interview. 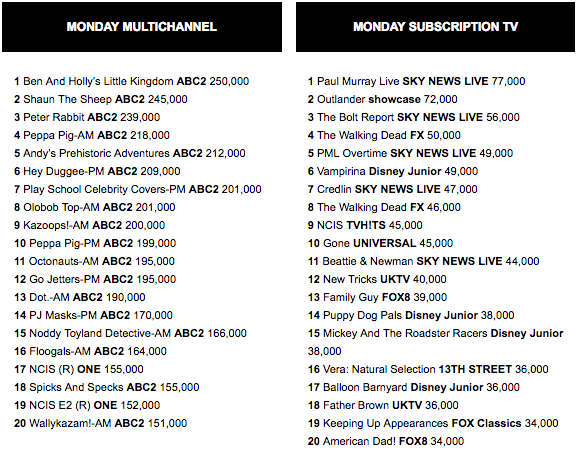 The Monday 7.30 did 863,000, outrating ACA by 50,000. With Australian Story finished for 2017, Back Roads has returned with Heather Ewart visiting Corryong in Victoria. The first episode did 743,000, not too far behind Australian Story’s 783,000 a week ago. Four Corners has finished too for 2017 with Foreign Corespondent in the timeslot examining what rising sea levels mean for islands in the Pacific Ocean. The episode did 644,000, down on Four Corners’ 713,000 last week. Media Watch looked at John Michael Howson, the Queensland election and Don Burke. The episode did 570,000 and will be back next week. Guests on Q&A included Guardian editor Lenore Taylor and The Feed’s Jan Fran with 435,000 watching. River Cottage Australia gets an early slot on Mondays with 178,000 at 7.30pm. The second episode of Doctor Michael Mosley‘s The Nine Months That Made You then did 221,000. 24 Hours In Emergency was on at 9.40pm with 194,000 watching.